There are some today who would argue that there is no such thing as "experience" -- lived experience, as it is sometimes called -- save as it is reducible to language and desire[...] abolishing at least what happens as an irreducible ontological order[...]. Say rather (as another interim strategy): The mutual inadequations of language and desire constitute what happens; the mutual inadequations of desire and what happens constitute language; the mutual inadequations of what happens and language constitute desire. [...] We only know any one of the three because of the gap between the other two. -Samuel R. Delany, "Toto, We're Back!" The year is 503, p.a. (post apocalypse). I'm controlling three NORAD troops under the stated mission of infiltrating a structure belonging to a faction known as the Salemites: an occultist group who have been experimenting with corpse reanimation for centuries in the aftermath of the last great nuclear war. Our main goal is to retrieve the US Constitution from the Salemite vault and exit the zone. There's more of a backstory to all of this but I'll skip the exposition because that's not where the game happens. We're equipped fairly well for the job; all three units are set with individual loadouts of small arms or a heavy machine gun, and assorted explosives and med kits. As with any game where I'm given pre-equipped characters, I'm trying to deduce and enact their intended roles: who is the scout, the medic, the damage dealer, the demolition engineer, and so on. My command points are limited, as is the available set of commands in the current context due to both the situation and the randomization of the set. Melee'ing the walls or searching the littered outdoor landscape would produce nothing, so moving and shooting seem to be the only relevant options. Fortunately I have a couple of command items under these categories, with large command point allowances, so I'll be able to make an effective blitz into the building. Designated "big gun" Nick Bolter takes point and successfully destroys the nearest door that leads into the facility, but the first re-animated zombie is already running down the hallway toward our team. An hour later, the situation is grim. My "scout" unit, Vasquez, used as both a sniper and line of sight monitor, was torn to pieces by two zombies. Line of sight plays a big role in the our ability to interrupt the opponent's turn, so we've lost more than just her set of actions; we've lost potential future turns and the ability to react. Our med kits are gone, and both remaining characters are temporarily holed up in the "Patient Room". James Woo is rifling through the cabinets, hoping the search command will produce something of use. The beds in this room will provide 1 measly HP per turn, at the cost of a precious command point, but Nick uses one to get out of his wounded state which has decreased his movement, weight allocation, max command points, and combat effectiveness. He's been a mess for a few turns now. Considering that two zombies have been revived, I decide to drop the main objective and go for the alternate win condition: kill all opposing team members. I'm probably going to lose this, but James managed to find a smoke bomb which might come in handy where we're headed: the opponent should be going "all in" and deploying everyone to the morgue for one last zombie resurrection. Maybe the element of surprise, or rather "uninterruptibility" (they can see us on the map just as well as we can see them) will work in our favor. The opponent changes his mind and decides on a more dramatic approach by sending everyone directly toward us. This isn't going to end well. In an act of perhaps nihilistic humor, Nick decides to take another nap for one more hit point before it all hits the fan. My son and I are absolutely absorbed with this game, as are quite a few other players since December of last year. Its dated visuals, garish color palette, and postapocalyptic premise form a thematic package that feels like something I would have gleefully purchased from a game retailer circa 1995; a turn-off for some, perhaps, but a treasure for others. Dependent on one's generation, a contemporary gamer might experience the theme as tongue-in-cheek nostalgia while younger players might see the game as somewhat ugly and derivative. I see it as rather "formally nostalgic", an effort to create something with an aesthetic and thematic design that is consistent in its vintage but stands on its own strengths and explores the possibilities of that theme without too much implied hipster irony. I've seen this formalist approach to retro game design with more frequency lately in games like Cave Story and Superbrothers: Sword and Sorcery EP, which is a trend that Michael Abbott has begun to analyze. In addition to the thematic throwback, what has engaged most players as they progress through the extensive tutorial system is the versatility of the narrative that grows around what initially presents itself as a tactical skirmish game. This is enabled through a complexity of mechanics that offer an uncommonly varied and contextual set of choices to the player during each turn. This could have easily been overwhelming to players if the designer hadn't made a couple of important decisions. First, most of the rules and mechanics are isomorphic, meaning their structure and logistics are, once learned, transferable to other rule-sets in the game as they are introduced. The mechanics are also designed to be conveyed through a modular iconographic language which is introduced to the user after most of the core systems are learned. This achieves a combined effect: rules need to only be conveyed once; most of their mechanics build into subsequent rules which function in consistent ways between themselves and can be communicated by placing a few icons on the appropriate components in the game. As you step through the tutorial you feel as if you're gaining fluency in a language that makes your game both tactically deeper and more narratively complex. It feels empowering and nearly --but not quite-- overwhelming at the same time. The end result is nothing short of brilliant: a deep retro-postapocalyptic strategy game that teaches the players its own language while giving them narrative scenarios to explore and mutate with this language. It's a structured, tactical, narrative sandbox that grows with each game, and players often repeat the tutorials for the fun of exploring different outcomes and interactions. Once these tutorials are complete, players are moved to a final set of rules that structure how they will auto-generate their scenarios... and the game pretty much explodes from there. At this point, I should come clean and clarify that none of this is happening in a video game. 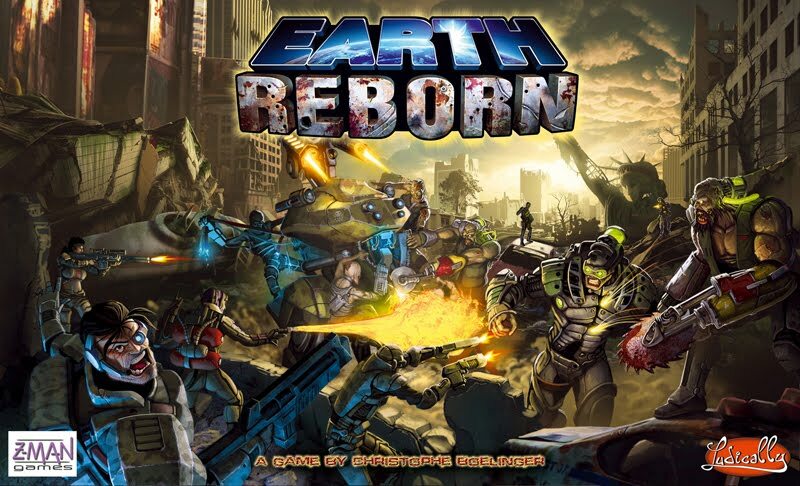 I've been trying to describe the appeal of a designer boardgame, Earth Reborn, by Christophe Boelinger, particularly in response to the boardgaming buzz coming out of the last GDC. I chose this game in response to the initial descriptions I'd heard from the conference which seemed to assume that a turn to boardgames was a "return to basics." At least that was a common interpretation of one of the talks on "Go, Poker, and the Sublime" where Frank Lantz discussed, in an almost phenomenological fashion, the richness of abstract games as manifestations of thought being "made visible to itself" and the lessons that designers could learn from these honed and proliferative systems of gameplay. This is certainly a rewarding vein to explore: developing more evolved or informed concepts of mechanics by looking at the poetics of non-digital games will be productive for many designers who might not have associated them with the problems they encounter in video game design. But Earth Reborn is not a good subject for Frank Lantz's approach in several aspects which make it all the more compelling for me as a board game. It is about as far from abstract or "Euro" games as one could go: almost every mechanic and rule has a thematic analog. It's the product of a board game auteur who often takes his own idiosyncratic approaches to design and builds the games "he wants to play," which along with his French nationality reminds me a bit of Eric Chahi in his relationships with his games. Incidentally, many of Earth Reborn's design choices are also influenced by video games, particularly the iconographic language system and concepts like "command points" (think of any turn-based SRPG in the past 10 years). But finally, and perhaps more critically for me, this game does not lend itself to an immediacy or transparency of "thought being made visible to itself". The pleasure of the game doesn't really reside there. If anything, one could argue that the allure of this game lies in the inverse process: "thought" here is first being shaped by the grammar of the game's rules which, once internalized, enable the player to express their decisions. But these choices aren't entirely controlled by player intent since dice-rolling mechanics add an element of randomness. This is, in effect, the pleasure of "submitting" to the game in the interests of developing one's agency within it while also seeing what emergent situations will be presented as unintended consequences of that agency. I think this argues for a learning approach that diverges a bit from Frank Lantz's by including the "Ameritrash" side of the boardgaming spectrum in our field of influence, since I feel that some of these are beginning to broach the same experiential territory as video games. Rather than treating boardgames as a quasi-classical set of almost platonic game forms (i.e. "back to basics"), why not look at them as equally vibrant, complex, and sometimes messy experiments that have evolved in tandem with (and sometimes under the influence of) video games and often strive, under their own unique devices, to convey mediated, collaborative experiences? In this model, both digital and non-digital games can be brought into a larger discussion that I hinted at with Samuel R. Delany's interim strategy for describing our complex interface with experience, with "what happens" in games themselves. "The mutual inadequations of language and desire constitute what happens." [T]he necessary feeling that greater excitement lay only a book away had already been clearly--and socially--established. It's a feeling--call it desire--that must be fixed to any genre if that genre is to be pursued; probably it must be fixed to any semantic category for that category to persist as a social reality. Like all desire it is formed on absence, the missed, the just-out-of-reach, the greater wonder and adventure waiting for us just over there that is what language, leaping ahead of experience, constantly creates via that gap. Bringing this back to gaming, desire is both what keeps us hooked to the game we're playing and keeps us looking toward the next game to fulfill something others haven't yet. It's something that maintains our engagement with a game if there is a compelling and potentially bridgeable gap between what the game's language is telling us --or instructing us in the ability to speak-- and our moment-by-moment experience within that game. Think of GladOS apologizing to you, telling you that the room you've just entered is a mistake and is unsolvable. This presents ruptures between what the game is telling you, your own previously tutorialized agency in the game, and the actions you are currently undertaking to make it to the next room. You know you are being lied to and you won't put the controller down until you prove this... and explore just how far the lie really goes. I want to get back to the gap between that desire and the ludic language that lags behind it or jumps ahead of it and constitutes the space where the game experience happens. In gaming I see the dynamics of an interface with experience that I feel are quite unique. The intent of the design, the functioning of the game itself, and the agency of the player are constantly engaged in a negotiation, building a model of what is supposed to be "happening" in the game throughout its duration. In the best games, or the ones I find most personally satisfying, this experience isn't occurring in the declared rules or representational language of the game, nor the player's own agency (as language). It forms in the slippage between this register of language and the expectation, the desire that impels the player to manifest and construct their concept of what the game is or could become as a consequence of their next step. Board games in the vein of Earth Reborn can achieve uniquely satisfying, evocative, and engaging experiences because this fluctuating process isn't abated in the interests of making mechanics or language transparent. The player's constant state of constructing and being constructed inform a large part of the pleasure of gaming in this genre and it's a state I would like to see developed and explored more fully in video games as well. We're beginning to see more of these explorations of experiential modeling in retro-oriented games, perhaps because of their often minimalist conceits in visual design. When playing these games I feel less like I'm being "plugged into" a narrative and/or ludic structure and given some choices and skillsets to propel it (e.g. Heavy Rain), but more like I'm shaping my personal experience of the game and its significance, its act of meaning and textuality. I'd be curious to see if this is possible in more representational games, or whether a certain defamiliarization of the game's presentation is almost necessary to engage this type of play. In any case, the current state of indie games gives me hope that while AAA development studios are hard at work on the next FPS on rails, there are other souls out there who see other possibilities, similar gaps between our current experiences in video games and what desire, jumping ahead of this experience, makes us believe might be out there to explore and enrich our understanding of what games are. This is the gap where language and interim strategies form, some expressed as games and some expressed in words.